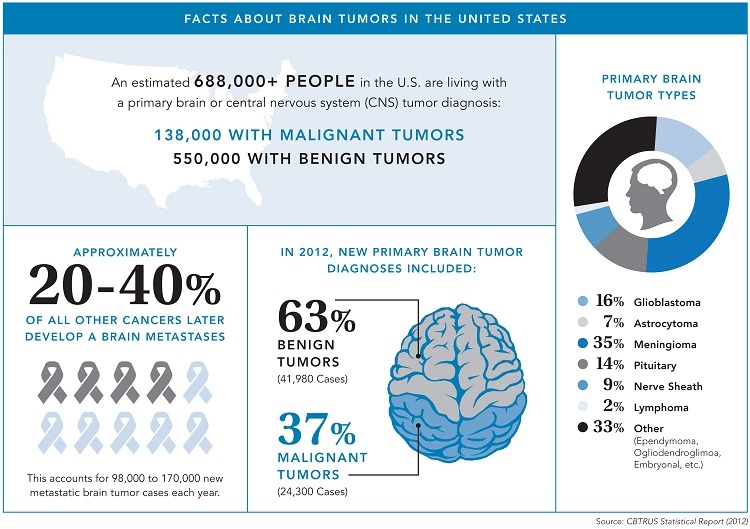 The facts about brain tumors in the United States are sobering. With nearly 700,000 Americans living with a primary brain tumor and 78,000 people diagnosed with a tumor in 206, raising awareness and taking action to help defeat brain tumors is critical. 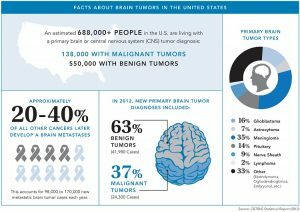 The month of May is Brain Tumor Awareness Month (BTAM). Click the image below for key statistics. Read and share informative blog content with your networks, friends and family - "get up to speed" on the latest content from the brain tumor experts. Register your own team at the closest NBTS Brain Tumor Walk, Ride, Race or Polar Plunge fundraising events. Check out the list here. Chat with the experts during a BTAM Twitter chat on May 18. Join the Expert Video Session on May 25 with Dr. Paul Mischel to learn about his most recent brain tumor research discoveries. Create your own community event to raise money for brain tumor research. Through more research and testing, the National Brain Tumor Society hopes to help discover new sources of treatment and fighting for policies to help improve the lives of patients, as well as providing resources and information to the public. For more information on brain tumors, check this website and/or download a brochure today.